Pi Patel is a very likeable Indian teenager who chooses to actively practice three religions: Hinduism, Christianity, and Islam. As the son of a zoo owner, Pi is also very knowledgeable about animals and their behaviors. The family zoo is located in the southern Indian city of Pondicherry and its animals and their habitats are described in detail. In attempts to escape civil unrest in India during the 1970s, Pi’s family decides to move to Canada. While some of their animals are sold in India, many have been sold to zoos in America and Canada. Pi and his family therefore set off on a Noah’s Ark type adventure when they board the ship, Tsimtsum, with their remaining zoo animals. 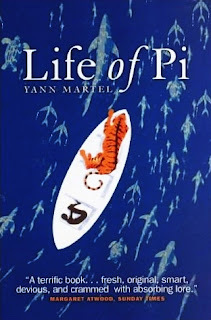 Not long into their journey, the Tsimtsum sinks and Pi finds himself alone on a lifeboat with an orangutan, a zebra, a hyena, and a Bengal tiger (whose name is Richard Parker). After Richard Parker kills the other animals, Pi attempts to stay alive by training the tiger as a lion tamer might tame lions in the circus. I have to admit that this is not a book I planned to read. I found it hard to imagine that a story about a boy being stuck on a boat with a tiger would be worth reading. I finally picked up the novel when it was chosen as a book club selection. While there is a little more detail and description than I would prefer, I thoroughly enjoyed the storyline. By far, my favorite parts of the book are before Pi and his family board the ship. Pi spends a good amount of time describing his life in India. He tells why he chose to practice three religions instead of choosing just one and he paints beautiful pictures of the animals and their lives at the zoo. There is also a bit of a twist at the end of the novel that I was not expecting. After experiencing this story in print, I am definitely looking forward to seeing the movie! We are self-proclaimed book snobs that take the word "nerd" to a new level. An average schoolteacher and librarian with active social lives and attractive husbands, we are two girls obsessed with all things literary. We're pulling our favorite books out from under our beds and other inconspicuous hiding places to share them with you.